A view of Auxiliary Fire Service (AFS) members participating in the “Dig for Victory” scheme in St. James's Square. During the Second World War, the British public was encouraged to produce as much of their own food as possible. 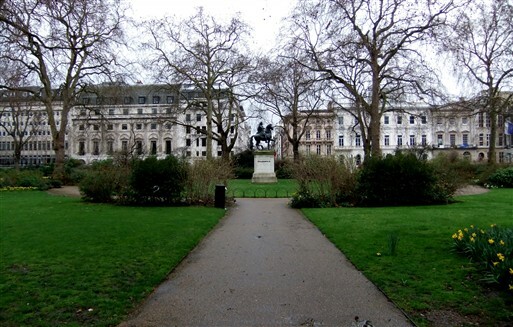 In this view, AFS men tend vegetable plots in St James's, an upmarket garden square in SW1 dating from the 1670s. The "Dig for Victory" campaign was launched after the German U-boat blockade threatened the supply of food into Great Britain. Back gardens, public parks and even the deep moat of the Tower of London were dug up and planted with vegetables to increase food production. On 23 February 1944, the western end of St James's Square was damaged when high explosive bombs fell close to the London Library and on King Street. Notice in Allinson's piece that the equestrian statue of William III has been removed to prevent bomb damage.